I’ve been tipped yet another time by one of my reader (Thank you Alex!) about an interesting low cost ARM device. 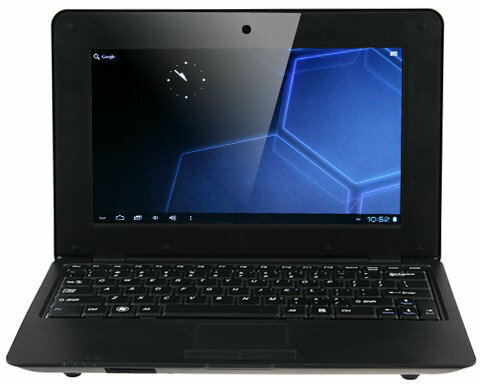 H6 Netbook is powered by AllWinner A10 processor with 1 GB RAM and 4GB Flash, features a 10″ display (non touch) and runs Android 4.0.3. I wrote about the Sunlike UMPC-1021 in April, but the H6 is the first AllWinner A10 netbook – that I know of – that is available for retail. Here are the specs of this ARM netbook. Display – 10″ LCD Display (no touchscreen) with 1024×600 resolution. This device supports the usually videos (AVI/MOV/MP4/RMVB/FLV/MKV…) and audio (MP3/WMA/WAV/APE/AAC/FLAC/OGG) formats supported by AllWinner processor. Google Play is pre-installed and Skype is said to work as well. Since it’s based on AllWinner A10, you’ll certainly be able to run Linux on this device, however I’ve noticed that 1024×600 resolution can be a problem on Ubuntu with some inaccessible buttons on some pop-up windows. The battery has a low capacity and I’d rather have around 10 hours battery life for an ARM netbook. From aliexpress delivery is about 50$. On Panda it’s just arrived, so the price will be lower(hope so). We’ve found the same netbook on Aliexpress eventually. 🙂 (I saw your comment after my update). But it may not be exactly the same as the on in this article, although it’s pretty similar. Oops! Looks like I found a cheaper/better deal in 7″ segment. If the objective is just to play then I think this should do the trick + via 8850 (cortex a9) is 25% faster then allwinner a10 (cortex a8) Also with 7″ screen means less pixel counts, can also mean faster performance. I think @cnxsoft can evaluate and can throw more light on this, vis a vis linaro port or Ubuntu port availability / development case etc. 10″ is as low as I would go for a netbook screen. I still could not find WM8850 kernel, so you’d have to use the Android kernel to run Linux. This is possible but there are some issues. But even if you can run Linux, I don’t think it would be nice to use at all on a 800×480 screen. The HDMI port may mitigate this. i am an hour out of bangkok at present. if you are anywhere nearby i would like to give you my novo7 aurora to play with and perhaps get it to run any linux. i have failed all tries and given up. Well, I’m also one hour from Bangkok… by plane! I live in Chiang Mai, so probably a bit far away. yes a little too far for my current plan. but i am mobile, perhaps loy gratong. but just perhaps. I have one and ended up here while searching for a firmware update. The firmware it came with is too unstable for the device to be functional. So far no luck finding an update so I’d avoid the product everyone (re: for now). If you can obtain the current firmware image (for recovery) for H6, you may want to try using Mele firmware (http://www.cnx-software.com/2012/08/13/new-android-4-0-4-firmwares-for-mele-a1000-a2000/). This is for STB, so I’m not sure if LCD display is enabled by default. If you try this, you’d better save script.bin or evb.bin (or other bin files) in the FAT partition, so that you could replace the script.bin in the firmware, with your own. If you want to play around you could also boot Linux with an SD card (Plenty information about this in this blog and on the web). could you post a vid about it ? Or link it if you already shot it ? What do you think of this one, also AllWinner A10-based: http://www.ahappydeal.com/product-91858.html ? Mention of 4500mAh battery attracts me. Also, do you think it’s possible to replace stock LCD screen with PixelQi 10.1″: http://www.pixelqi.com/our_screens ? It looks very similar to the one discussed in this post, except as you mentioned, the battery capacity is bigger. Personally, now I’m not very interested in single core ARM netbooks, especially if you want to Linux, as dual and quad core versions should be much faster and not cost that much. The resolution (1024×600) is also a problem if you run Ubuntu (I have experience with my x86 netbook). I don’t know about the LCD thing. hello i have the same one i dont succeed to boot linux . have you succeeded ? i suppose it is almost working because i can see some logs in the /var/log folder somebody has succeeded to install linux ? I don’t own it, I’m not sure if somebody has run Linux on this one. One step is to the script.bin or evb.bin from your device, and replace it on your image. Im need firmware on this device (H6) too. I don’t have the firmware, try to ask where you bought it.